In contrast to previous years when exports provided the main contribution to German economic growth, household consumption is expected to become the key driver in 2015. Germany’s robust economic performance since 2010 has since led to an annual drop in the number of business failures. 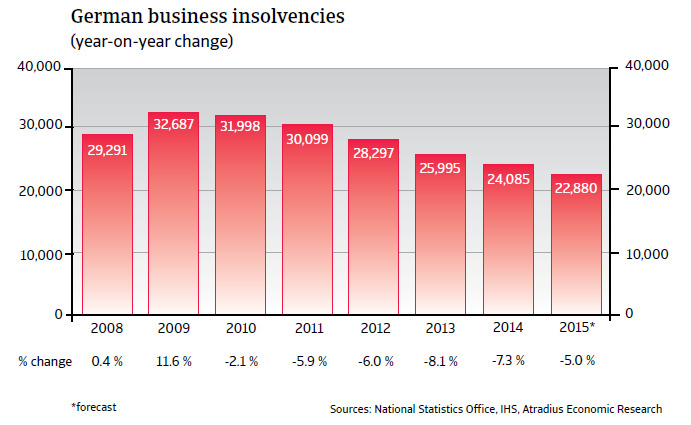 In 2014 business failures decreased by 7.3%, to 24,085 cases. Given the positive economic outlook it is expected that the default environment remains stable in 2015. After modest 0.2% GDP growth in 2013, the German economy recorded a solid growth rate of 1.6% in 2014. This trend is expected to accelerate in 2015 with a 2.1% expansion driven by export growth and increases in private consumption, industrial production and investment. In contrast to previous years when exports provided the main contribution to German economic growth, household consumption is expected to become the key driver in 2015. 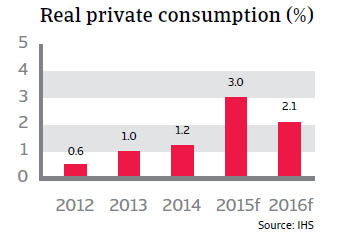 Private consumption is expected to increase 3.0% in 2015 after a 1.2% increase in 2014. This surge is attributable to lower oil prices, rising wages and a further decrease in unemployment. Consumer confidence has steadily increased since Q3 of 2014, and unemployment is expected to decrease further in 2015, to 6.3% from 6.7% in 2014. 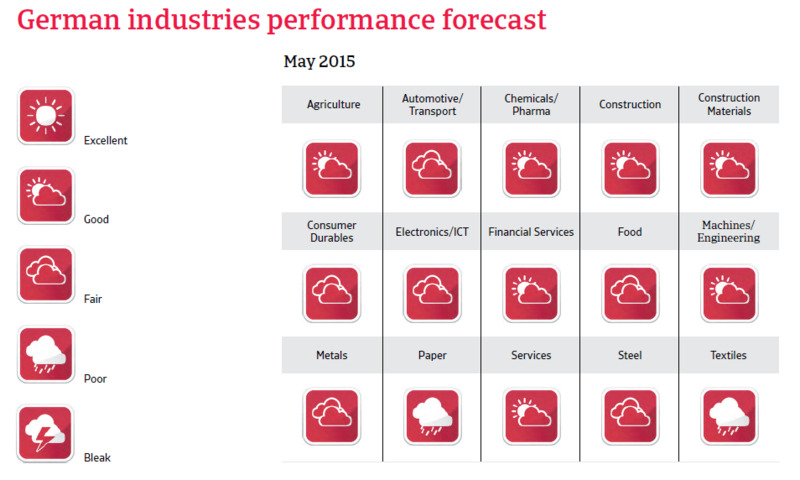 Industrial production growth accelerated 1.4% in 2014 and is expected to increase further, by 3.1% in 2015. 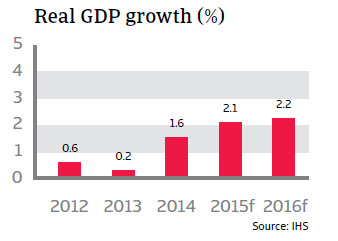 The same trend is expected for investments; estimated to grow 4.8% in 2015 after 3.4% growth in 2014. According to the German Statistics Office, price-adjusted exports and imports increased by 3.7% and 2.0% respectively in 2013, and the trade balance surplus decreased to EUR 217 billion. Exports to EU-countries increased 5.4% last year, while exports to non-EU countries rose 1.5%. 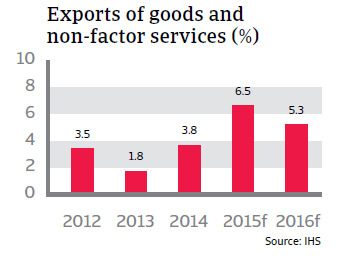 Exports are expected to increase by more than 5% year-on-year in 2015, driven by the rebound in the eurozone, while the lower euro exchange rate helps to boost German exports to non-EU countries. 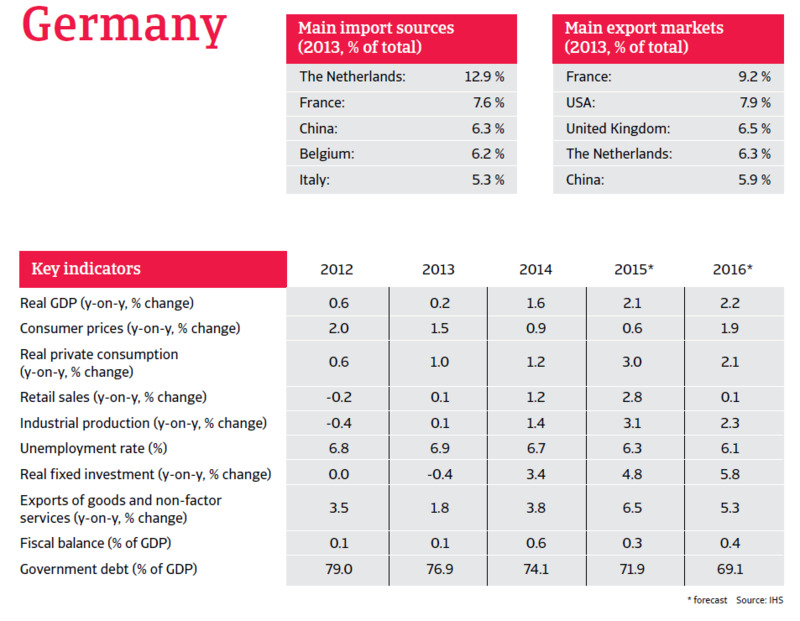 Overall, German exports to non-EU countries have outpaced export growth to its EU peers in the last couple of years. While in 2000 exports to EU members still accounted for 65% of German exports, this share dropped to 58.0% in 2014, while the share of shipments to non-EU countries increased from 35% in 2000 to 42% last year. Another budget surplus in 2015? Germany passed a debt brake law in 2009, forcing the government to cut its spending. 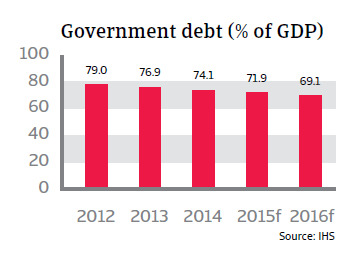 After a transitional period, the law sets an upper limit for new structural debt of 0.35% of GDP to be reached by 2016 and then to remain at that level, with additional borrowing possible only if the economy is weak. The federal government reduced the deficit to 0.9% of GDP in 2011 and has achieved slight budget surpluses since then, due largely to higher tax revenues and lower government transfer payments for unemployment. In 2015, the budget is expected to record a surplus of 0.3% of GDP, while public debt is expected to decrease to 71.9% of GDP. Survey respondents in Germany show a risk averse approach to trade credit which may be explained by a notable increase in the level of overdue domestic and foreign payment over the past two years. The German steel sector is profiting from robust domestic demand, mainly from the construction and automotive industries, with apparent steel use expected to grow 4.5% in 2014.